Megan Fabian during her time in Uganda. 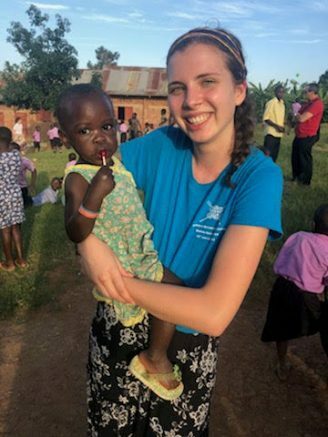 Megan Fabian, a West Seneca resident and a 2016 graduate of Mount Mercy Academy, continues to live out the mission of service that was fostered in her during her years at Mount Mercy Academy. Attending Mount Mercy definitely impacted Fabian’s choices and activities at the University of Scranton. She credits learning about the life of Catherine McAuley, the foundress of the Sisters of Mercy, as the source of inspiration for her love of service, and she strives to emulate her brave and selfless footsteps. During her senior year at Mount Mercy, Fabian spearheaded a drive to raise $3,000 in order to participate in the meal packaging event sponsored by Stop Hunger Now. She then coordinated volunteers to form an assembly line to fill bins, scoop food items, package and weigh them and then seal 12,000 meals. The group of volunteers then packaged the meals and loaded them onto pallets and moved the pallets onto a truck. “Junior year theology is what inspired me to fundraise for the meal packaging event during senior year when we raised enough for 12,000 meals to be shipped to schools, orphanages and medical centers in Swaziland, Africa, and it continues to inspire me to sign up for both domestic and international service trips, remain involved in social justice clubs, and volunteer at local schools and centers to serve the local community,” Fabian explained. Mount Mercy Academy, a distinctly Catholic college-preparatory high school, is dedicated to educating young women for academic excellence, compassionate service, Christian leadership, global awareness and life-long learning. A junior at the University of Scranton in Pennsylvania, Fabian continues to dedicate herself to academic excellence and life-long learning while actively practicing compassionate service, Christian leadership and global awareness. Most recently in January during her semester break, Fabian traveled to Uganda with three professors and 31 other students. Although Uganda is probably not on a visit list for most college students, it was for Fabian. While there, they built a mud house with and for the Batwa community and helped at the Masaka Hospital, the poorest hospital in the country. The home of Batwa people is Bwindi, the southwest region of Uganda. The Batwa are native rainforest people who had been evicted from the rain forest by the government and forced to settle in a village. The Batwa are extremely poverty stricken as they continue adjusting to a drastic lifestyle change, such as learning to farm for the first time. In addition, the group experienced the Ugandan culture, learning about Christianity in Africa while visiting the landing sites of Catholic missionaries, attending a mass at a local Catholic church and visiting a local Anglican church and experiencing a traditional Anglican mass. The group also learned about traditional Ugandan religions. They also visited several schools including a nursing school and learned about health care in Uganda while touring clinics and hospitals. They hiked in and experienced the various types of geography in Uganda, such as the savannah, rain forest and waterways. The experience was extremely moving and impactful for Fabian. ”The Ugandan people will always hold a special place in my heart. The most powerful part of the trip was experiencing the immense joy and hospitality of everyone we met. We traveled throughout the country and met new people every day, yet every single person shared the same welcoming attitude. I have never seen and felt such joy as I did in Uganda,” Fabian said. In addition to her trip to Uganda, Fabian has also participated in a domestic outreach trip to the Appalachian area of Kentucky during her sophomore year spring break. The application process for the eight to 10 outreach trips is competitive and includes an application and a personal interview. After a few weeks students are notified if they have been selected and what trip they have been selected for. While there, students from Scranton as well as several other colleges and universities came together and worked alongside full-time home repair crews to ensure that families in need had homes that were safe, warm and dry. Fabian was in a group with students from the other universities and installed insulation under a house, fixed a gaping hole in the hallway, leveled the floor in the living room and worked on siding along the house. Fabian is pursuing a double major in exercise science and philosophy, and plans to stay at the University of Scranton for the three-year Doctorate of Physical Therapy program. Despite her academic load, she still finds time to be active as a Catholic Relief Services (CRS) ambassador. CRS is an international humanitarian agency that helps the poor and vulnerable. The group directly serves basic needs in poverty stricken countries, often providing natural disaster relief and also advocates ending injustices. The CRS Student Ambassador Program is a way for college students to advocate and raise awareness on their campus. The University of Scranton is one of 98 campuses across the country working towards global justice, peace and human dignity. As an ambassador, Fabian works with four other students and a campus minister to raise awareness and solidarity through informational club meetings, awareness campaigns and advocacy. As a CRS ambassador, Fabian has had the incredible opportunity to speak on Capitol Hill on behalf of those whose voices are not heard, advocating for migrants and improved global hunger funding. “I felt drawn to the organization and got involved because it works for the things I am most passionate about, ending injustices and treating all people with peace and solidarity,” Fabian explained. Be the first to comment on "Mount Mercy alumna continues to serve others at home and abroad"